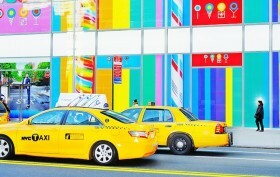 Mitchell Funk’s super colorful urban photography is the perfect pick-me-up to brighten your day. Browse through the collection on Fubiz. Gothamist provides a virtual tour of the Brooklyn Army Terminal, designed by Cass Gilbert in 1919 as the country’s largest military base through WWII. Sen. Charles Schumer proposes a bill to protect landmarks. According to AM New York, it would increase the penalty for crimes such as trespassing on the Brooklyn Bride and One World Trade Center, like we saw over the summer. Apartment Therapy talks trash day in NYC. We can smell it now…. 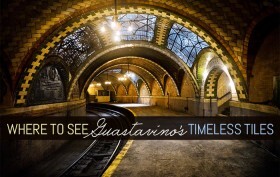 Guastavino did more than just tiled arches. Daytonian in Manhattan takes a look at a row of Moorish Revival rowhouses he designed on West 78th Street.